The CE4 is a powerful base level electronic cigarette that offers a serious vape experience. One of the most popular ecigs on the market the CE4 provides a superb vaping experience and mimics an actual tobacco cigarette perfectly. The CE4 happens to be one of the most affordable and easy to use ecigarettes around which is why it’s so popular. 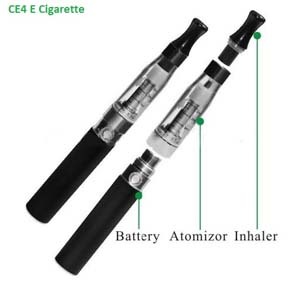 The CE4 electronic cigarette is the most popular selling e cigarette on the market and its easy to see why. This model of e cig caters for light and heavy smokers and is the ideal choice for beginners due to its performance and simplicity of use. The standard 650mAH battery can delivery a surprisingly strong vape through the CE4 clearomizer unit which suits most types of vapers. Although the 650mAH battery will only last around 8 hours of heavy vaping the fact that there are two in each starter kit means you can always carry a spare around with you. The recharge takes around 1.5 to 2 hours. I found the CE4 a consistent e cigarette device which is why its great model for first time vapers of even experienced vapers who want a simple device that can provide a decent vape hit. Obviously the batteries that come as part of the CE4 starter kit are 510 threaded which means you can use them different clearomizers if you wish such as the Vivi Nova, Mini Pro Tank and kangertech T3S. the 650mAH batteries will still deliver a good kick through one of these higher end clearo tanks should you decided not to re-purchase a CE4 clearomizer tank when it comes time to dispose of your old one. That leads me onto the only downside I can see with this type of electronic cigarette is the fact that the CE4 tanks need replacing roughly anywhere between 4-5 weeks as the atomizer coil head in the CE4 eventually burns out and stops working. That said all clearomizer coils burn out after time and you need to replace the coil insert on all of them plus purchasing a new CE4 clearomizer is easy enough and you do get a spare one within the starter kit. being a disposable clearomizer does make add to its simplicity of use as you do not have to fiddle with unscrewing bits and putting bits back together again. The CE4 will allow you to simply fill and use until its time to renew. Filling the CE4 clearomizer is simple and easy, the only issue is making sure you don’t get the e liquid in the ventilation metal tube in the middle. However the starter kit does come with a needle filler bottle which makes this job simple. 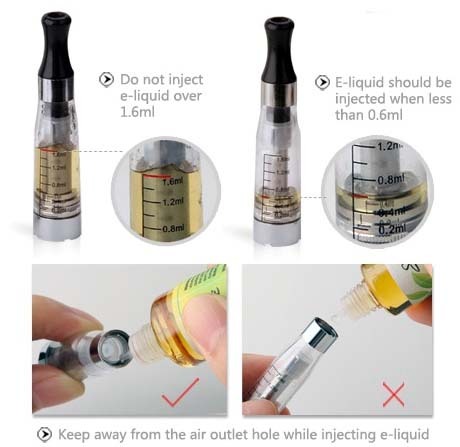 Once you have filled about .5 of a centimetre into the needle filler bottle you insert the needle nozzle down the clearomizer side by-passing the middle unit so essentially you are dripping your e liquid down the side.